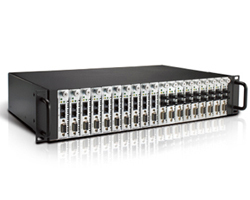 The TRC-190 series provides 19 slots for media converter modules from the CSM-200 series of Ethernet-to-fiber modules and the TCF-142-RM series of serial-to-fiber modules. A TRC-190 chassis comes with one AC or DC power input, with an optional redundant power expansion module available for greater reliability. The TRC-190 series' power input module supports the hot-swap feature.